Since 2009 AFROCKAINE has ruled over their country’s Rock music scene in Algeria. Their name alone is what set them apart from the pack, first. 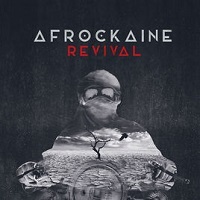 AFROCKAINE have created a powerful hybrid of Traditional African music and Nu Metal sound, and they are hellbent on letting their beast loose on the unsuspecting public. From the first song on their debut album “Revival”, they present themselves as a breath of fresh air to the music scene. We are treated to an insane mash up of traditional percussions and modern strings in “We’re Back”. They feature lyrics in their native language that pair perfectly alongside their unique sound. “Revival” and its subsequent track “Back to the Roots” are both love songs to how Rock and Blues sounded back in the day. Both songs serve as a fitting testament. “By My Side” rocks a serious Bob Marley vibe if he decided to experiment with Stoner Metal (it wouldn’t be all that out there). “Angel” is a sweet ballad that sounds so out of character on an album that so aggressively swaggered in with zero qualms in the beginning track. “Ya Nar” (which if Google Translate is correct means ‘O Fire’) is sang entirely in the band’s native tongue, and native percussion courtesy of Lamine. “African Sacred Fire” includes more traditional instruments and chanting, as does “Avancez” which, for a song that has no English lyrics, it’s super catchy. AFROCKAINE sets themselves apart from the typical Metal crowd. They don’t scream or growl or go insane with blast beats. They groove, they let their passion for the music do all the talking in their songs, channeling their aggression in a more subversive way than what is typically expected for the genre. AFROCKAINE expertly incorporates their native roots, 70’s Rock and Blues rhythm into a force of nature that should be recognized around the world.